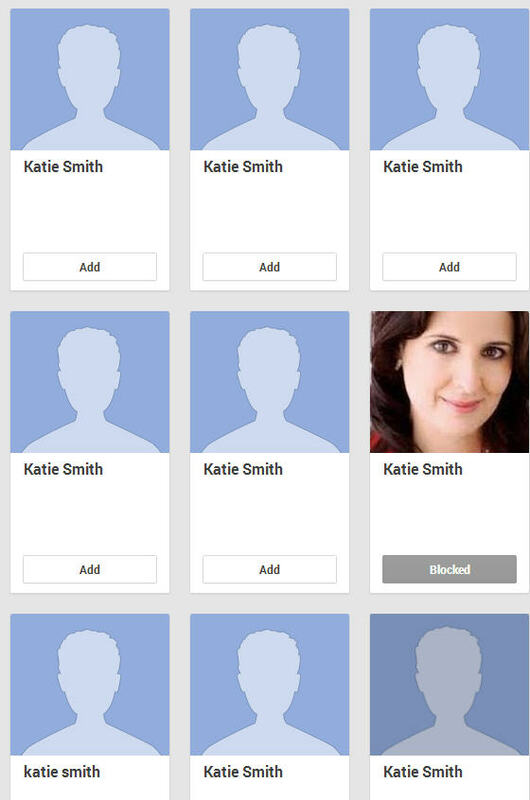 This is the second time Ken has seen a profile on a social networking site that falsely uses my photo. Last year the same thing happened on LinkedIn and I had to jump through several hoops to get LinkedIn to flag the profile in violation. We will see what happens…. So I decided to run my Google Images search early. I usually run one every six months just to make sure I am who I purport to be online and that no one is using my image falsely. To my chagrin, I found several profiles on YouTube and one on a website where my photo is being used as someone else’s profile. The “company” name is Orthofill and the website is a dot net. Since I know it’s a bogus site, I don’t want to include a link here in the event that the website carries a virus or some other malware. 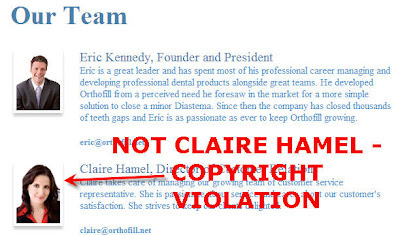 My photo is being used on the “team” page attached to a woman named “Claire Hamel.” Rest assured that our legal counsel will be contacting GoDaddy.com since the site is registered with them (and of course, Orthofill’s registration is private). A cease and desist letter will also be forthcoming. Needless to say, I’m beyond aggravated! 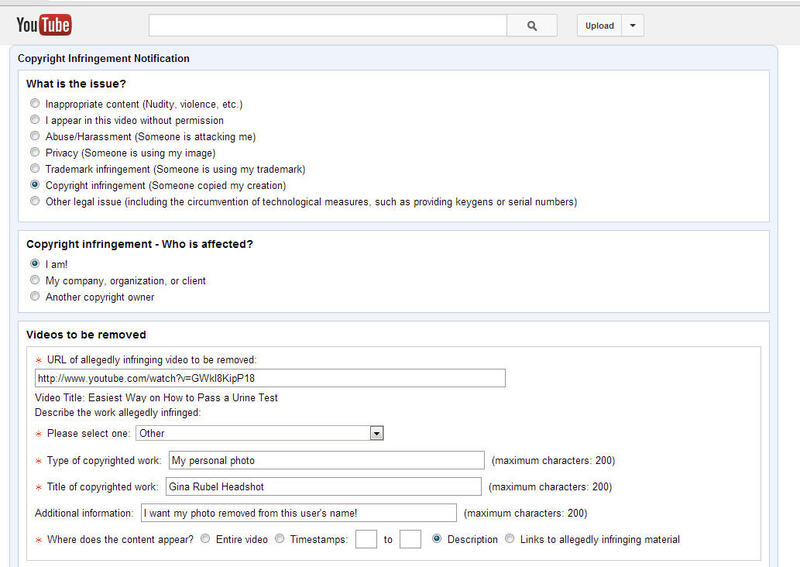 I just hope the folks at YouTube do the right thing by removing all the B.S. video posts that have my image attached to the person who posted the videos. 1) Schedule a Google search of your name (in every conceivable form) on your calendar every three months. Look to see what is out there about you. I also do this with the names of various family members, my company and blog. If you find anything suspicious, you may have to take steps to have the content removed (not an easy task). 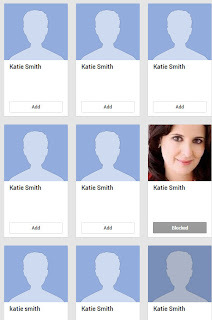 2) Schedule a Google Images search of your headshot. Here is an excellent video that demonstrates how to do this. 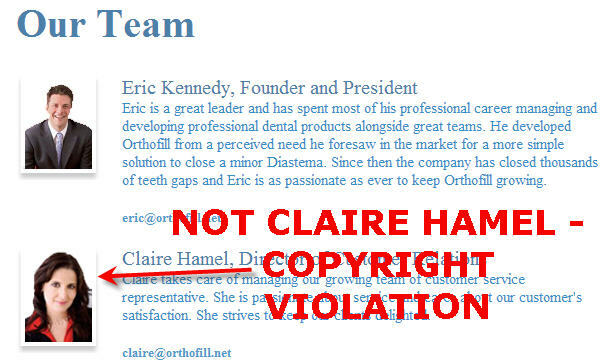 It is important to know who owns the copyright to your headshot too. I own mine which I purchased from the photographer but oftentimes, the company that commissioned your headshot or the photographer actually owns the copyright. This can lead to more hurdles when dealing with infringement issues and filing complaints with social media sites. 3) After filing a complaint, if your issue is not resolved, you may need to contact legal counsel. Start with an attorney that focuses on intellectual property law issues and be sure they have experience dealing with IP issues and the Internet. I’ll be keeping an eye on the several complaints I filed today. Stay tuned and share your Internet identity war stories too. Misery loves company. Delighted I could help. Now I've got to see who's posing as me!